The 28th episode of THE FIRE AND WATER PODCAST is now available for your listening pleasure! THE FIRE AND WATER PODCAST is the official podcast of FIRESTORM FAN and THE AQUAMAN SHRINE. 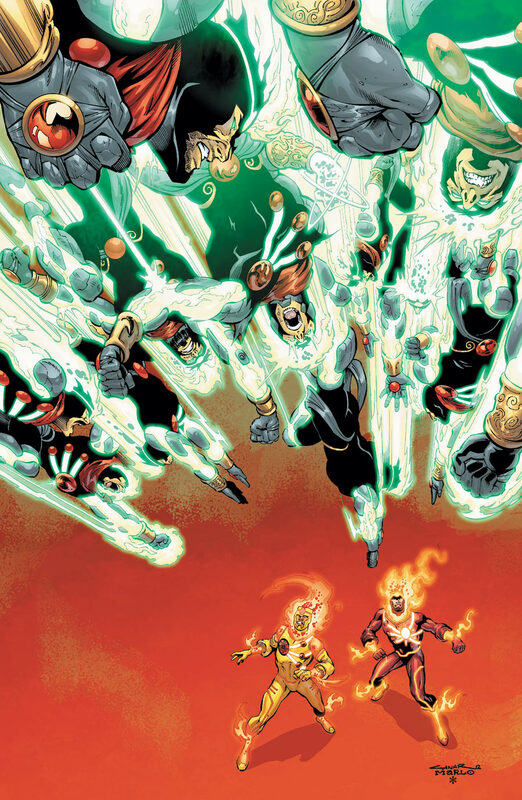 This episode Shag and Rob talk about The Fury of Firestorm: The Nuclear Men #12 (by Joe Harris, Yildiray Cinar, Marlo Alquiza, Daniel DHR, Walden Wong, Travis Lanham, and Hi-Fi)! We also chat about Rob’s major award, Shag’s podcast-cheating on Rob, and our new Tumblr site! Finally, the podcast wraps up with a double-sized dose of your listener feedback! You can find the 28th episode of THE FIRE AND WATER PODCAST on iTunes. While you’re there, please drop us a review on the iTunes page. Every comment helps! Alternatively, you may download the podcast by right-clicking here, choosing “Save Target/Link As”, and selecting a location on your computer to save the file (38 MB). As promised during the show, here is a link to Sean Tiffany’s podcast and blog, Back to the Drawing Board! 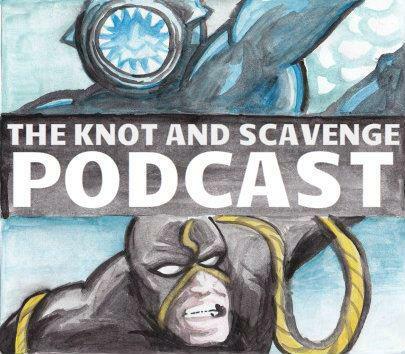 Also, below you’ll find Andy Kapellusch’s concept for a spin-off podcast, THE KNOT AND SCAVENGE PODCAST! Finally, check out the virgin cover (meaning without the logos) to the The Fury of Firestorm issue covered on this podcast! Click to enlarge! Posted in: Comic books, Firehawk - The New 52, Firestorm #09: New 52 v1 (Firestorm Protocols), Firestorm comic vol. IV, Joe Harris, Mikhail Arkadin/Pozhar, Podcast, Ronnie Raymond, Yildiray Cinar. ← Brimstone is soooooo not a Martian Manhunter rogue! 1. I LURV “The Knot and Scavenge Podcast” concept art. I love Black Manta, but he’s profoundly silly looking. Scavenger has an antiquated otherworldliness to him that works creepiness in a way Aqua-Vader never could. Was he really in a run of Warlord issues? We need a theme episode! I think this is the first time I’ve started commenting before I’ve even started playing the episode. 3. Sharing a villain with Firestorm is like sharing a woman with Tom Arnold. Thanks to Shag’s readers for helping me vote Brimstone out of the Martian Manhunter’s rogues gallery. 4. Commenting on listener feedback feedback feels a bit meta, but let me just say I got laffs. Love the podcast, never missed one and still got some to catch up ~ though I couldn’t resist and listened to the most recent ones first… awesome job guys, keep them coming! Well, I’m all caught up now Shag (a fact I’m sure you can ascertain from my recent Twitter posts). Happy to hear everyone is doing well and looking forward to meeting Rob at NYCC. It will be an honor. Thanks again for all you two do! Great episode as usual. And I’m pretty sure Captain Carrot and His Amazing Zoo Crew are going to be moving into the “Z” Building. I mean, come on. Who the hell else could it be? They’re the obvious choice. Keep up the good work. Now I’m off to Episode 29.